Image Processing – 16 Versus 8 Bit. JPEG is a lossy 8-bit format. An 8-bit image has 256 levels of brightness, from 0 (black) to 255 (white). A 16-bit RAW image has 65,536 levels of brightness or, put another way, 256 mini levels of brightness in between the 256 levels (65,536 divided by 256 = 256). This represents a huge increase in captured information which means you have plenty of leeway for making adjustments. You don’t need to work in 16-bit all the time, especially if storage space, software or computer processor speed are issues. But if you are working on an image that requires adjustments, especially to the brightness of the image, 16-bit will give you maximum headroom. Process your image as a RAW, TIFF or PSD (Photoshop Document) file – if you are starting with a JPEG fie, convert it to a TIFF file first. You can convert back to 8-bit after you’ve finished editing. 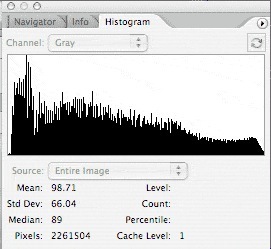 Look at the histograms of images that have had the Levels adjusted and you can see that the diagram of the 8-bit file has lots of spikes just like a ‘comb’, which indicates some brightness levels have been lost. The spikiness occurs because the 256 levels of tones have been stretched out leaving gaps. This means that some tones in the image will be missing, degrading the image – known as posterization, showing noticeable jumps in tonal values – known as artifacts. 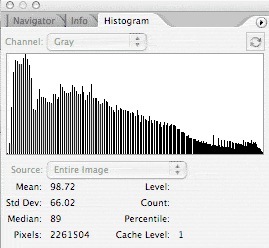 Make the same adjustment to a 16-bit image and you’ll end up with a much healthier looking histogram which is characteristic of an image with fine, smooth tonal transitions.